Happy hour at Trader Vic’s. Victor Bergeron, best known as Trader Vic, in 1944, created this classic cocktail. The Second World War was in full swing on fronts in Europe and the Pacific and Bergeron was keen to create a mood-lifting cocktail made with the best possible ingredients. He first presented the drink to two friends visiting from Tahiti. 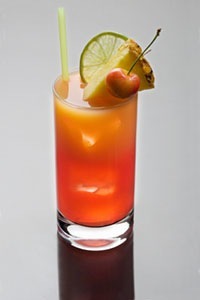 His guests replied, Mai Tai, which in Tahitian means out of this world. Place all of the ingredients, along with cracked ice, into a cocktail shaker. Give it a vigorous shake and pour unstrained into a large highball, Collins glass, or a festive Tiki inspired glass. Garnish with a lime wedge and a sprig of fresh mint. Try not to add one of those little paper umbrellas.